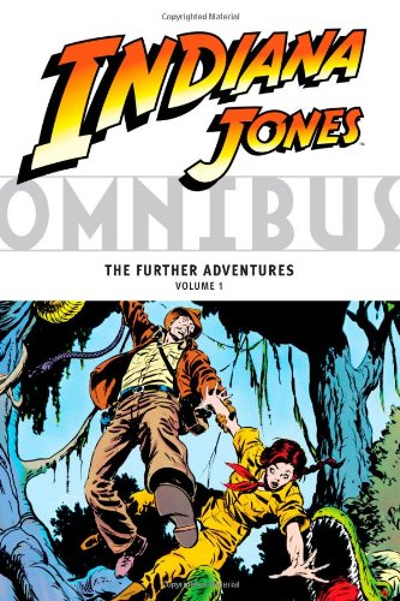 Indiana Jones Omnibus: The Further Adventures Vol 1 is a bumper collection of early eighties Marvel comics featuring the famous archaeologist adventurer from the iconic Lucas/Spielberg film series. You get Marvel's three part adaptation of Raiders of the Lost Ark and then ten all new original stories (of which many are split into two parts). There are various artists and writers involved here including Denny O'Neil and David Michelinie. One slight shame though is that John Byrne - so famous for his classic work on X-Men - left after a couple of issues because he wanted to do multi-arc Indiana Jones stories for the comics and they wouldn't let him for some reason. 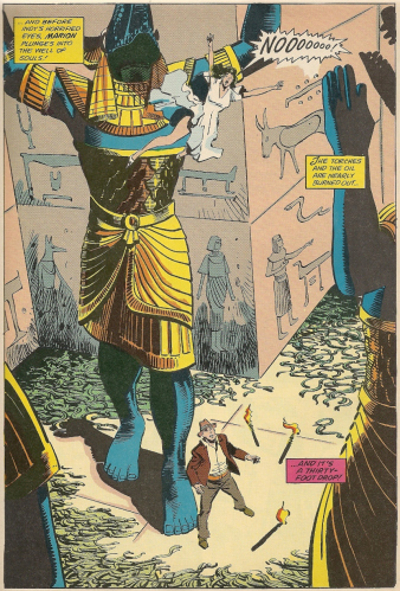 As a fan of both Indiana Jones and Marvel I have always been curious about these comics and although the art is sometimes no great shakes (these were weekly comics and produced fairly quickly) it is effective and the spirit of Indiana Jones is nicely captured at times. With death defying cliffhanger situations on almost every page you can almost hear the famous music by John Williams. Marvel's adaptation of Raiders of the Lost Ark is actually really good all things considering and the illustrations are more in key with the characters/actors than the stories that follow. Later on, Indy is sketched in a slightly vague generic impressionistic way but here he really looks like Harrison Ford at times with his leather flight jacket, fedora, whip and revolver. I don't really need to explain the plot of Raiders of the Lost Ark to anyone surely but just in case you've been living in a cave your whole life with no access to television it takes place in 1936 and has archeology professor Dr Indiana Jones tasked by the American government to locate the Lost Ark of the Covenant before the Nazis. The Ark has dark mystical powers and if Hitler gets his stinky paws on it first it could mean big trouble for everyone. The German military is conducting an archaeological dig in the desert near Cairo and Indy has to team up with old flame Marion Ravenwood and his North African friend Sallah to foil their scheme. Opposing him will be rival French archaeologist Dr René Belloq (now working for the Nazis) and sinister Gestapo interrogator Major Arnold Toht. Let the comic strip adventure begin. This is fun even if you have seen the film gazillions of times. One of the things that I most enjoyed here was the inclusion of linking material that you never saw in the film (maybe they shot it and didn't include it, or maybe it was in the original screenplay, but I don't know really). So, for example, you get to find out how exactly Indiana Jones managed to cling onto that German U-Boat all the way back to its base. It's funny, but the last time I watched Raiders of the Lost Ark I was actually thinking about that. One minute he's on the side of the boat as it begins to dive and the next scene has him in the German U-Boat base. The solution is obvious in hindsight. The comic goes back further than the film when it begins and gives us some background to the expedition that leads Indiana Jones to the temple where he must outrace that huge boulder and evade numerous lethal booby traps. Nice likeness of Alfred Molina here by the way and just like the film he comes to a nasty end. There is an element of the macabre here that is enjoyable and perfectly in spirit with the films although it seems to me that Spielberg was far more gruesome and dark in the first two Indy films and seemed to try and lighten up later on. The colours used in the panels are quite striking at times, with yellows, greens, reds, as sole backdrops. I love some of the imagery too. Indiana Jones swinging on his whip in near silhouette with his ever present hat. The Ronald Lacey lookalike appearing sinister behind his spectacles and SS trenchcoat. My one criticism would be that many of the backdrops are rather spare and some more detail would have been welcome. It's a lot of fun though and a nice nostalgic blast if you've grown up with the film and love Marvel comics. The other stories in the collection are a bit more hit or miss (not having Raiders of the Lost Ark to crib from so to speak) but still entertaining. These stories are similar I suppose to the James Bond Express strips they produced after they'd used up all of the Ian Fleming stories. It's a new take on Indiana Jones but respectful to his universe. The Ikons of Ikammanen and 22-Karat Doom! are the two comics Bryne worked on before he left in a mild huff. His writing and pencils are very good and the stories are not bad at all. In the former a student claims to have found the Ikons of Ikammanen and when he is murdered Indy travels to the African town of Krikambo to find the student's sister. When she is kidnapped by villain Solomon Black the plot thickens. 22-Karat Doom! continues the story with nautical capers and our heroes trying not to induce the wrath of the Ikon. There are a few twists and turns that I quite enjoyed here. Byrne's plots are pretty good and it's a shame that he couldn't have written more of these. The Devil's Cradle was written by Denny O'Neill and has Indy meeting a four-hundred-year-old man named Prospero. Immortality shenanigans but very Indiana Jones all the same as the film series was far more fantastical than some give it credit for. The art can be rather lackadaisical at times in some of these issues but it's always enjoyable and if you have boxes of old Marvel comics you will find it rather cosy and comforting. There are a few continuity errors with the art/backdrops as we slide into a new issue (or even change artists altogether) but you are used to this from Marvel comics anyway and how very Saturday matinee cliffhanger serial. Gateway to Infinity! marks the arrival of David Michelinie to the comic. Indy has to investigate a crystal cylinder found in Stonehenge but the pesky Nazis are on his trail as usual while The Harbingers continues the adventure. It transpires that the Nazis are trying to open up a portal to another dimension and it's up to our hero to stop them. Club Nightmare! is fun because it marks the return of Marion Ravenwood and takes us to her Manhattan nightclub - Raven's Nest. It's opening night and the special guest is none other than Frank Sinatra but sabotage is on the cards and Indy and Marion must get to the bottom of it. I liked this one for the atypical plot and it's great to see Marion again. Africa Screams! has our adventurer hero recovering a Piute summoning stone stolen from the National Museum and tangling with international artifact thieves. The villain here is an old foe and there are Atlantis references too. Crystal Death continues the story with Indy and Marion heading to Cameroon where they meet a group of Nazis and encounter the mysterious Shintay. More Atlantean lore is included in the story here. The Gold Goddess: Xomec's Riders sees the welcome return of Sallah and he must team up with Indy to recover the gold Chachapoyan idol that was stolen from him in Peru by Rene Belloq. Nice touch! The Gold Goddess: Xomec's Riders continues the story and brings crossbow wielding Ilsa Toht, sister of Ernst Toht, into the orbit of Indy. The Fourth Nail: Blood and Sand! finds Indy mixed up in a search for the fourth nail of the crucifixion and takes him to Australia while the next installment finds our hero in Barcelona where he meets Marion again and must evade an Arabian ninja. What I liked most about these comics I think is the way they riff on our knowledge of the film series and so it's always enjoyable when you get a reference to Raiders of the Lost Ark or Marcus Brody turns up. They aren't perfect but if you are a fan of Indiana Jones and Marvel you should have a good time and at over 300 pages you do get a lot of material here.